Are You Establishing Boundaries or Erecting Walls? 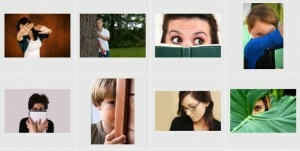 Why does stock photography frequently depict an introvert as hiding behind something? They show us with bags over our heads, peeking out from behind curtains or doors, or covering our eyes and turning our faces away. Stock photo results from a search for “introvert.” Seriously. These images play to the stereotype that introverts prefer not to be seen or heard, or that we’re timid, nervous types. As with most stereotypes, there’s at least a grain of truth. But that truth is far afield from what most people assume. I was recently in New York City and had the opportunity to spend an afternoon alone at the Museum of Modern Art. To my delight, photography was permitted. So I set about visiting my must-see pieces, iPhone at the ready. It was amazing! But at some point, I realized that I was spending more time trying to get a good picture (and wishing people would get out of my way!) than I was looking at the actual work of art. So I set an intention to stop putting the phone in between me and the masterpieces and focus on being fully present – to the art, to the people around me, and to the entire experience. How does this connect to introverts hiding? We think that the stereotypical image of introverts hiding is about withdrawing, being anti-social, or being shy. But I think if there’s any truth in it, it’s more about the need for introverts to create boundaries in order to protect their energy. We might “hide” in order to put a bit of energetic distance between ourselves and the environment. It could keep us from being overwhelmed by giving us something to focus on (I think that was part of my iPhone fixation at the museum, in addition to just wanting to remember which pieces really grabbed me). This might look like taking on the role of photographer at the party, being engrossed with our phones while we wait in line, or even taking furious notes at the team meeting. These activities serve a dual purpose: they give us a useful task while keeping us from draining too much energy. But what I learned at the museum is that if we’re not thoughtful about it, the task becomes less of a boundary and more of a wall. It doesn’t protect us; it cuts us off. It is possible to establish boundaries without erecting walls. Boundaries allow people to feel your presence more, without requiring you to expend a lot of energy. Walls isolate us and prevent us from experiencing the social interaction that even introverts need in regular (albeit small) doses. It might sound simplistic, but I’m convinced it’s a matter of mindset more than trying to do something differently. You can still use your phone, take notes, or wear your headphones. Use them as a way to anchor yourself. Every once in a while, look up, make eye contact, smile, ask a question or engage in a moment of small talk (which is sometimes painful, I know! Try accepting it for what it is – small – and release expectations that it has to be anything more). Be aware of your surroundings. Put down the device, take off the headphones, look around, and connect with your environment. Then go back to your anchor, using it as a tool rather than a barrier. The next time you find yourself in a social or public situation, notice: are you using your camera, phone, notepad, or other device to “hide” or disconnect from others? Or are you using it to create a role for yourself that facilitates engagement or balances your energy? For instance, taking photos makes it easy to mingle, or being the scribe shows participation without being put on the spot. I won’t deny it: sometimes, we will jump into a task that seems like a socially acceptable way to “hide,” and that’s okay. The point is to be conscious of our choice, and know which choice will serve us best in the moment. PS: This post is based on a shorter piece I shared in my bi-monthly newsletter. The newsletter includes exclusive content, tips, and resources just for subscribers. Join us! Sign up is at the top of the right column on this page. Great Piece Beth! I don’t think of boundaries so much in the physical sense, but more about taking care of myself around preserving energy, and also not falling into the role of care-taking (i.e. note taking, volunteering to take photos, etc.) because I’m the one who usually does it. The wall-thing tends to happen for me when (as you say) I’m not fully present. It’s the default mode, and an easy way to play the introvert card! Such rich discussion from this post. Thank you! Being very shy, also lacking in confidence, and having physical appearance issues that make people feel sorry for my looks, it is particularly hard when I also am mostly intovert but have enough of extrovert trait to feel lonely when am ignored, forgotten and ‘othered’ by people, and kept out of the loop with what’s going on. For example, I went to church as usual last Sunday and was surprised to find that only a quarter of the ususal number was there. The rest, I found out later, had arranged among themselves to have a vacation in a beautiful holiday spot and meet up at one of their number’s holiday houses. As has been the bane of my 55 years of life, I was the last one to find out. BTW, I was like the girl in the song “At Seventeen” always the last one chosen for any group activity, sport or otherwise, as a school girl, and it has been the same the whole of my life. Great insight Beth, as usual. It made me think about a boyfriend I had who was a reporter. Every event he attended he was the person taking notes, interviewing people, but not engaging and being a part of the event. He said it allowed him to be there without having to worry about mingling or interacting because he had a job. I know it’s always easier when I have a job at certain social events. That way my mingling has a purpose. I also find I get to know people better when I have something to do. That’s why I love being on the board of Women Business Owners. It allows me to get to know people easier and more deeply. I’m going to pay attention to when I pull out my phone. Am I doing it to avoid contact or do I truly need to attend to something on my phone? ArdenClise Arden, the story you share here is precisely the dilemma: we often feel more comfortable if we have a role, and that’s great! I often recommend that tactic for networking and social events. But if that role prevents us from connecting, it’s less satisfying, for us and the people we’re with. It’s a fine line sometimes! Good on ya for being mindful of your phone. Great way to check in with yourself. Great article Beth! I love the analogy of taking pictures vs. relishing in the art work. I totally agree, it is more about how you use the tools that “protect” yourself vs. banishing them altogether. I think being aware of how you’re using it and how often is the 80/20 for not totally cutting yourself off from what could be great social interactions. Great article! I’m totally guilty of hiding and distancing myself in certain situations. Being aware of it helps me to bring myself back and out of hidding, tho sometimes I prefer to stay hidden. This was so on-point. I’ve always used tools to build walls and that’s got to change now. I’m going to be more mindful of my environment, while still preserving my energy. I found your website through a recommendation. Great job!